I was leafing through a local fashion magazine when something familiar caught my eye. 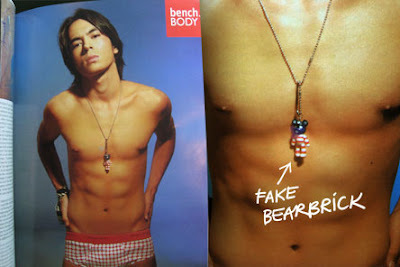 There it was, hanging across the bare chest of a young, sassy-looking model named Jake Cuenca was a bearbrick (see Bench Underwear print ad below)! I knew, of course, that there existed no such bear on a chain, and closer scrutiny proved that it was a fake! The rounded hands and feet, the big ears, and the small ribcage were clear indications. Check out my earlier post, 'The Case of the Bogus Be@rbrick / Part 1', for other telltale signs. Lately, bootleg bearbricks like these seem to be proliferating – I've seen quite a few attached to manbags, keychains and even mobile phone straps! At the topmost left is the original Series 1 U.S. 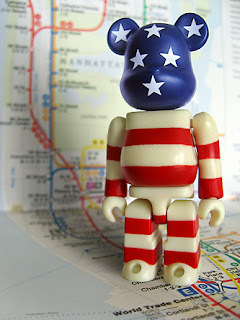 Flag Be@rbrick, which I shot against a map of the New York City subway system. It was one of the first bears I bought. Back then, I was still clueless about fakes – so I guess I was lucky it was for real. You have amazing eyesight. I can't see the details you mentioned but I believe you. Do they make real bearbricks for mobile phones though? Mila, the image was larger in actual size :-)! hello po pahiram po ng pic ni jake para malagay sa fansite nya. thank u in advance. about popobear vs bearbrick...at least this will help me differentiate between fake and authentic sellers. I'm starting a collection and don't really know where to find the real ones. I recently bought a bearbrick on eBay and when i set it down next to my others, i noticed that it was actually a few millimeters smaller. The legs and arms were noticeably shorter. Both are 100%. I was worried I was sold a fake. Any experience with these? Could I have been fooled?? Colin, yes, some bearbricks are a bit smaller than the others. :-) Which one did you buy? It was Series 16 Cute (Gachapin I believe). Also, my Spongebob, Ren, and Stimpy are smaller. Why do they make some smaller? when they're all 100%? Do they make any fake 400%? I have a Kaws Dissected Bearbrick i purchased from a seller on ebay. Have you heard of any cases?